Ridership was only down overall about 1 percent from a typical Monday morning for this time of year. More Metro personnel will be at the Ballston-MU Station to help riders get to their trains. Problems during the AM rush had a big effect on a commute. which riders had already been bracing. Commuters on Tuesday navigated their second morning rush hour since the start of Metro's massive SafeTrack repair plan. Riders found some additional delays, including after a train on the Red Line malfunctioned about 8 a.m., leaving a crowd in the Gallery Place-Chinatown station. Haven't yet started dealing with the new reality of Metro? Read on for everything you need to know. The first of Metrorail's 15 "safety surges" began Saturday, ushering in 13 straight days of single-tracking on the Orange and Silver lines between Ballston and East Falls Church -- yes, even during rush hour -- through June 16. Trains will also run less frequently; in some cases, much less frequently. On weekends, trains run every 18 minutes before 10 p.m., and every 20 minutes from 10 p.m. to midnight. Also, the entire Metrorail system will close nightly at midnight, even on the weekends. 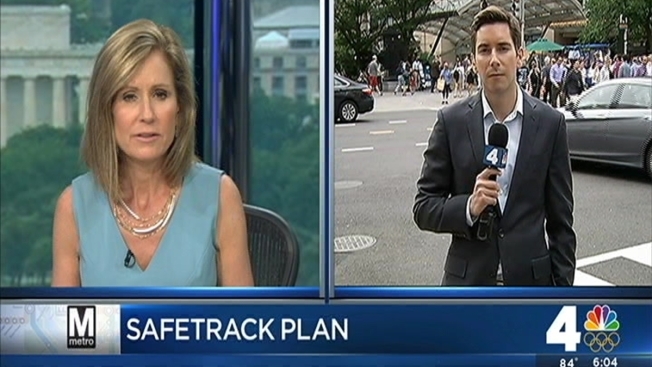 Monday afternoon, Metro leaders felt confident about how the first commutes of SafeTrack went, despite some issues. They said ridership was only down overall about 1 percent from a typical Monday morning for this time of year. "I want to urge everyone, whatever you did today, do tomorrow, do Wednesday do for the duration of this surge," said Metro Board Chairman Jack Evans. "Because it worked OK today." Ballston (Orange/Silver lines) -- Trains headed east through Ballston may be especially crowded, WMATA said. Riders arriving Ballston should consider using the extra train service that originates at Ballston and will board on the opposite platform. This may make your trip longer, but will likely provide riders with less-crowded trains. Limited shuttle bus service is available between Ballston and East Falls Church, and Ballston and West Falls Church. Another 14 safety surges will have major impacts around the region for an entire year; the next begins June 18. See the entire SafeTrack schedule here. See Metro's complete list of Metrobus routes in the affected areas. Fairfax County's Fairfax Connector bus is also beefing up its rush hour service. Herndon to/from Pentagon:Route 599 (PDF) will have extra trips between Herndon and the Pentagon. Vienna to/from Pentagon: A new route will be created between Vienna and Pentagon; see the schedule here. Biking: The Washington Area Biking Association (@WABA) previously tweeted this Google map of D.C.-area trails, bike lanes and bike-friendly roads. Find Fairfax County's bike map here. If you need to tune up your biking skills, check out WABA's classes on learning to ride and urban cycling online here. Need to rent a bike? Capital Bikeshare stations are located throughout the area; you can see rates or sign up here. Carpooling/Slugging:Fairfax County recommends commuters call or visit Commuter Connections to find potential carpool riders in their areas. Drivers can use the I-95 and I-495 Express Lanes for free with three people in the car (but you'll need an Express Lanes E-ZPass Flex transponder). VDOT also recommends checking out Slug-Lines.com if you're interested in slugging ("casual" carpooling to meet HOV requirements). Driving: Drivers should expect increased traffic. If you must drive, leave yourself plenty of extra time to get around. Try to carpool if possible (see Commuter Connections info above). In addition, D.C. is beefing up parking restrictions during SafeTrack (see the map here), and will have more traffic control officers on the streets. Lyft and/or Uber: You might want to download a ride-hailing app like Lyft or Uber now. Find the Lyft app here for either iPhone or Android, and the Uber app on iTunes here or on Google Play here. Lyft said it will offer Metro riders discounted rides throughout SafeTrack's phases; see discount zones and info here. Uber says UberPOOL, in which passengers share cars, will be available across the entire D.C. area through the year of SafeTrack. Other regional buses: Check the schedules for Arlington County's ART bus, Alexandria's DASH bus or Prince George's County's The Bus. Taxi: You can, of course, hail a cab on the street, but you can also order one online or by phone. DC.gov has a list of District taxi companies online here. Arlington County has seven authorized taxi companies; find them here. In Fairfax County, five cab companies are authorized to operate; find their contact info here.